Until just recently I was under the misguided assumption that most repatriates from Panama back to their island homelands were met with a warm and welcoming reception from family and childhood friends. In conversing with several of our seniors, however, I was chillingly set straight. Most repatriates from the Panama Canal Zone and or the urban centers of Panama City and Colon were usually met with hostility, disdain, hatred and, worse of all, envy. “Most?” I asked my subjects now well into their 70’s and 80’s. “Most!” was their emphatic response. This phenomenon is not limited to repatriates from Panama, I later discovered, but, is rather widespread throughout the world and during different periods of our planet’s geopolitical history. But, since we are focused on the Silver people of Panama, I will relate two examples of the kinds of experiences that the West Indian repatriates (and in the second example, an expatriate) had. Miss Lottie would send money back home to Jamaica faithfully to her nephew whom she treated as a son, including money for him and his family. She entrusted her nephew with purchasing a lot and the materials to build her small home for when her husband’s time to retire from the Zone came they would have their little nest to return to in their island home. Note that this was around the early 1950’s when the Silver Roll workers were not yet paid a “retirement” as such but were paid from the relief rolls, usually a paltry $15-$25 a month. So, this home was an important investment as the payments came from a very low salaried “local rate worker”as the Silver Roll was euphemistically called. 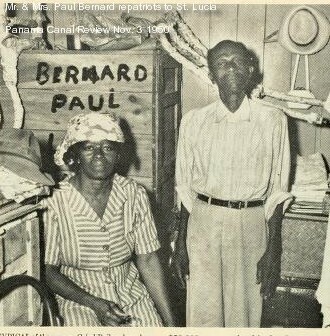 The years passed quickly and soon Miss Lottie and her husband were ready to leave Panama behind and settle into their little home in Jamaica. Just in time too as La Boca and several of the other Silver Townships were being dismantled and their mostly West Indian residents were being evicted and/or resettled. Miss Lottie had received a photo of the home and word from her nephew that he would be waiting for them both when they disembarked from the boat bringing them in. With photo in hand, spirits high and hearts filled with hope, Miss Lottie and her husband made the journey back home for the first time in a long time. They were met at the dock by her nephew, as he had promised, but with the worse possible news an elderly couple could hear. After greeting her nephew warmly, she asked him if he was going to take them to see their new home. He answered flatly, “No, as it is not YOUR home but MINE. There are no papers on that home with YOUR name on them but MY NAME.” With that startling revelation, Miss Lottie and her husband were told to go find lodging somewhere, anywhere they could find it as they were not welcomed in that house. Even the furniture she had sent from Panama to furnish the house was HIS. The shock of her nephew’s cruel treachery almost made her swoon but she rallied strength and, thanks to some kindhearted person, they were able to rent a tiny room for a very modest sum as they had left Panama with very little cash. They would both face extremely difficult days ahead as the husband’s pitiful monthly allotment could not cover their new reality in Jamaica. My subject, B, fought back the anger as she heard this story second-hand from a childhood friend from La Boca and vowed that she would contact their Miss Lottie and try to help her. She flew to Jamaica from Brooklyn to visit another relative and took time to go visit Miss Lottie. She was horrified when she first saw her sweet Miss Lottie after so many years. Miss Lottie had gone from a bubbly, plump motherly figure with a generous “derriere” to a gaunt and sickly shadow of her old self. Miss Lottie related the same tearful, painful story over again to B. In that moment she went into the neighborhood and talked another kind soul into renting the couple a larger and more modern room and left Miss Lottie and her now ailing husband in a better living situation. She also promised to send $10 a month every month as a way of supplementing their meager income. She was joined in this endeavor by her two other La Boca friends who had grown up knowing the couple. All told they sent $30 – $40 a month extra to the couple until their deaths. Although this amount may not seem like a lot, in those years the extra money provided this couple with a much better outlook. But, nothing could really erase the heartbreak of the inhuman reception they received as repatriates at the hands of a trusted relative. A fate that awaited many repatriates, as I soon discovered. This entry was posted in Jamaica, Silver and Gold Roll, Silver Townships in Panama and tagged La Boca, repatriations-from-the-Panama-Canal, retirees from the Panama Canal Zone. Bookmark the permalink. I am so sorry to hear about miss Lottie, but the Bible says trust no one and let no one trust you. I have heard of a woman coming home from England and her own son paid the Taxi man to Kill his mother so she would not get what she had worked so hard for. I do not believe in having no one in Jamaica handles my money, because you don’t know who to trust anymore, If I want some thing done I will do it my self. when my Parents were alive I could depend on them. I love my people, but money brings the evil out in people. So many people this has happened to. If you can’t get down there to do it yourself, put the money in the bank and let it sit there until you are ready to go home. When you get there, rent a little room and get your house build the way you want it, and for God’s sake keep your mouth shut, everyone does not need to know your business.